YARA is an awesome tool especially for incident responders and forensic investigators. In my scanners I use YARA for anomaly detection on files. I already created some articles on „Detecting System File Anomalies with YARA“ which focus on the expected contents of system files but today I would like to focus on the size of certain system files. 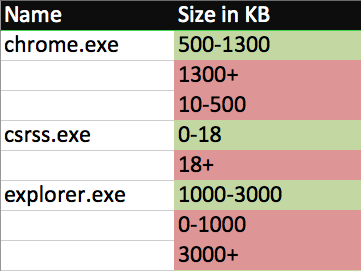 I did a statistical analysis in order to rate a suspicious „csrss.exe“ file and noticed that the size of the malicious file was way beyond the typical file size. I thought that I should do this for other typically abused file names based on this blog post by @hexacorn. I used my VT Intelligence access and burned some searches to create this list. You can find a spread sheet of this list here. It can be edited by everyone. I created some YARA rules that use the external variable „filename“ to work. LOKI and THOR use the „filename“ and other external variables by default. I’ll update the list on the LOKI github page. For a current version of the YARA signatures visit this page. description = "Detects uncommon file size of explorer.exe"
description = "Detects uncommon file size of chrome.exe"
description = "Detects uncommon file size of csrss.exe"
description = "Detects uncommon file size of iexplore.exe"
description = "Detects uncommon file size of firefox.exe"
description = "Detects uncommon file size of java.exe"
description = "Detects uncommon file size of lsass.exe"
description = "Detects uncommon file size of svchost.exe"
description = "Detects uncommon file size of winlogon.exe"
description = "Detects uncommon file size of igfxhk.exe"
description = "Detects uncommon file size of servicehost.dll"
description = "Detects uncommon file size of rundll32.exe"
description = "Detects uncommon file size of taskhost.exe"
description = "Detects uncommon file size of spoolsv.exe"
description = "Detects uncommon file size of smss.exe"
description = "Detects uncommon file size of wininit.exe"
I ran this rule set over my goodware database and got only a few false positives. Feel free to use these rules wherever you like but please share new rules or statistical analyses on other system files.